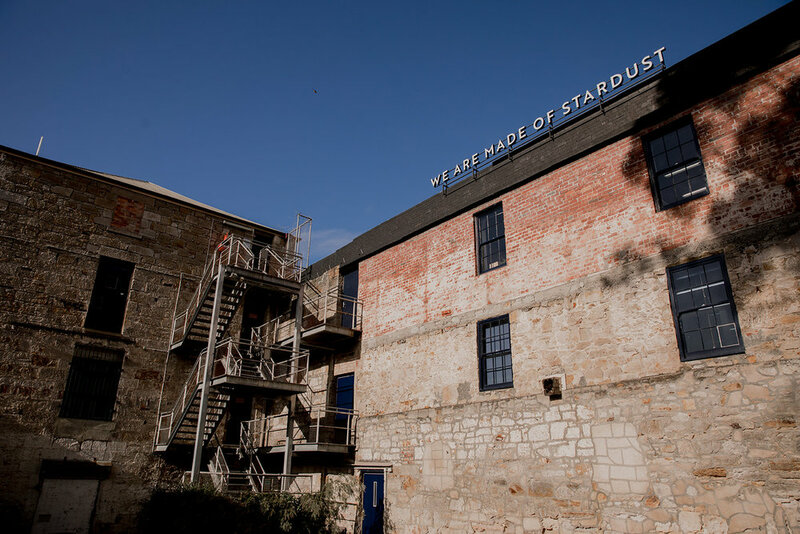 We Are Made of Stardust (Hobart) was commissioned for Kelly’s Garden as part of the Three Portraits Project, which explores Salamanca Arts Centre’s past present and future. 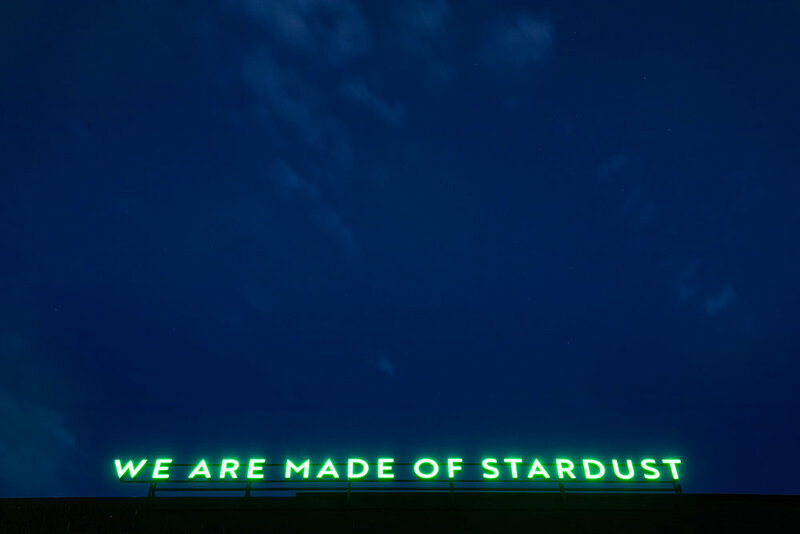 The installation explores humanity’s relationship with the cosmos, reflecting on the impact that scientific knowledge has on our understanding of ourselves and the world around us. Mounted above the audience and addressing the sky, the text looks out beyond the city to contemplate the vast expanses of time and space. Appearing subtle white during the day the work comes alive at night as the illuminated letters become visible against the darkened sky. 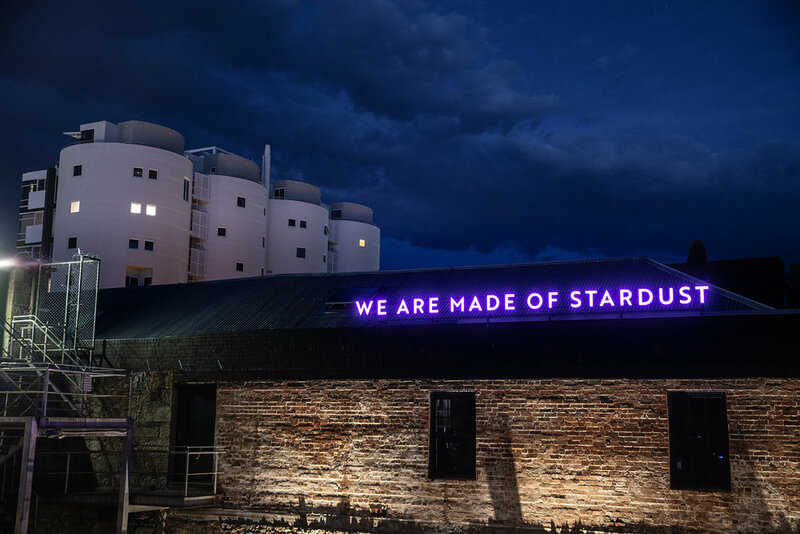 Scrolling through the colours of the visible light spectrum We Are Made of Stardust (Hobart) considers both the limitless and finitude of existence; a celebration of the beauty and majesty of the universe. Accompanying the lettering is a live soundscape from the project A Galaxy of Suns. Created in collaboration with composer Amanda Cole, programmer Warren Armstrong and astronomer Michael Fitzgerald A Galaxy of Suns ‘plays’ the stars as they rise and set over the horizon, in real-time, for any location on Earth. Treating the Earth as a giant spinning music box the project connects GPS and time coordinates to data from the Hipparchos stellar catalogue to create an atmospheric rendering of our journey through space. The artist and Salamanca Arts Centre wish to acknowledge that the Centre stands on the country of the Muwinia people. In recognition and reflection of the deep history and culture of the island, we also acknowledge the Tasmanian Aboriginal Community, who are the traditional owners and continued custodians of the land and waters of lutruwita (Tasmania). This project was made possible with the support of the Tasmanian Community Fund, as well as the Australia Council for the Arts, Hobart City Council, Arts NSW and Experimenta Media Arts. Salamanca Arts Centre acknowledges the generous support for Kelly’s Garden from Mitch and Deborah Miller, of Aspect Design and Gallery Salamanca.